It's not the most conventional journey, but some reports suggest that North Korean leader Kim Jong-un could soon be making his way to Vietnam by train, for an upcoming summit with US leader Donald Trump. If such a journey does take place, it's expected to take at least two days and could see Pyongyang's leader travel more than 3,000km (1,860 miles) kilometres to Hanoi. But Mr Kim's travel plans often remain highly secret. The last summit between the two leaders in Singapore was similarly shrouded in mystery. It was clear Mr Kim would have to fly in but it wasn't clear what plane he would be coming in on until the very last minute. Similarly, it's highly likely we won't find out much about his chosen mode of transport or route until he actually arrives. But what would such a journey look like? What route would he take? Japanese and South Korean media first cited sources saying Mr Kim was likely to take his distinctive green and yellow private train from Pyongyang to cross the border town of Dandong into China and then go onwards to Vietnam. Later sources told Reuters that Mr Kim would stop at the Vietnamese border station of Dong Dang where he would disembark and drive 170km (105mi) to Hanoi by car. However, NK News had earlier speculated that Mr Kim would take a train straight to Hanoi - which would entail a rail route of 4,153km. "[If he takes a train straight to Hanoi] it's likely that he would stop at Gia Lam station," Mark Smith, who runs a train travel website, told the BBC. "That is the station that has standard gauge tracks," he said referring to the only kind of tracks that can accommodate Mr Kim's train. How long would the journey be? According to Reuters, the journey could take at least two and a half days. This means he would have to leave in advance to make it in time for his expected arrival in Vietnam on Monday. The summit with Mr Trump is expected to take place 27-28 February. Of course the duration is dependent on whether he takes a car from Dong Dang or a direct train to Hanoi. Mr Smith says it could take closer to three nights if he makes the journey entirely by train. 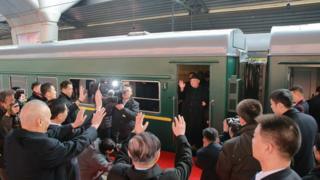 "It's less than 24 hours from Pyongyang to Beijing and then from Beijing to Hanoi is about two days," Mr Smith said. "His train is unlikely to exceed 160km/h." Why would he go by train? It's not clear why he might want to make the long journey by train. His father Kim Jong-il and grandfather Kim ll-sung reportedly had a fear of flying and avoided air travel. But Mr Kim appeared to have no such issues, making a trip from North Korea to Singapore for the June summit in an Air China plane. However, Mr Smith suggests that the journey by train could be more comfortable than one by air. "Mr Kim's train is likely to have an office, lounge and sleepers," says Mr Smith. "He's got room to move and is likely to get lots of work done and will arrive relaxed. It'd be more like a cruise on rails than the 18:03 to Tunbridge Wells." Why is the summit happening in Vietnam? It is an ideal location for many reasons. It has diplomatic relations with both the US and North Korea, despite once having been enemies with the US, and could be used by the US as an example of two countries working together and setting aside their past grievances. Ideologically, both Vietnam and North Korea are communist countries, though Vietnam has rapidly developed and become one of the fastest growing economies in Asia.